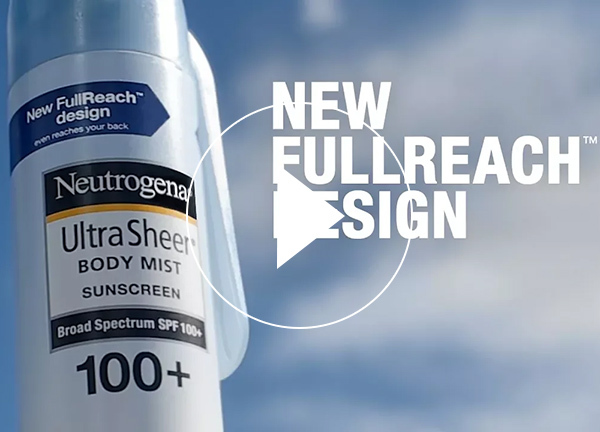 NEUTROGENA® ULTRA SHEER® Body Mist SPF 45 FULLREACH™ Sunscreen Spray provides powerful sun protection in a sheer, lightweight finish. Plus, the FULLREACH™ spray is designed for hard to reach spots. Neutrogena® Ultra Sheer® Body Mist Sunscreen Spray with Broad Spectrum SPF 45 provides powerful sun protection that you will love to wear. Formulated with HELIOPLEX® technology, this non-greasy sunscreen provides superior UVA/UVB protection in a sheer, ultralight finish. Plus, the FULLREACH™ design extends your reach so you can easily apply powerful protection, even for hard to reach spots like your back. Neutrogena® Ultra Sheer® Body Mist Sunscreen with Broad Spectrum SPF 45 is non-comedogenic and oil-free. Alcohol Denat., Isobutane, Dimethicone, Diethylhexyl 2,6 -Naphthalate, Trisiloxane, PPG-5-Ceteth-20, Acrylates/Octylacrylamide - Copolymer, Cyclopentasiloxane, Fragrance, Acrylates/Dimethicone Copolymer, Tocopheryl Acetate, Ascorbyl Palmitate, Retinyl Palmitate, Tocopherol.